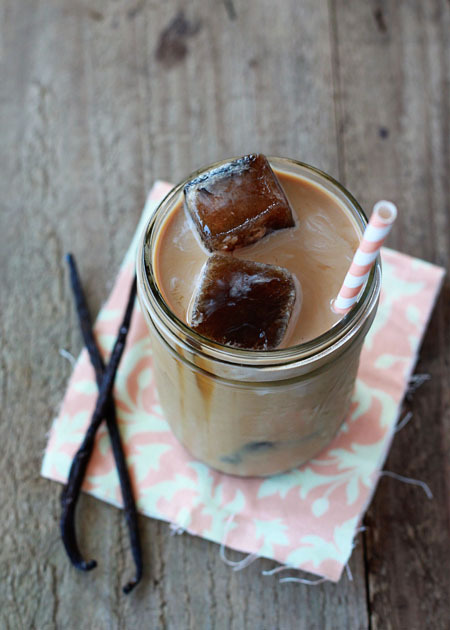 Rich, creamy, and subtly sweet, this iced coffee drizzled with vanilla-infused maple syrup will give you jitters in all the right ways. How did I live life before iced coffee? Granted, with a young toddler in my life, I sleep less than ever these days (yeah, I totally know that’s the 500th time I’ve mentioned it), so maybe that’s why I can’t imagine a life (and especially a morning) without a frosty glass of the stuff clutched between my desperate hands. Who knows, though. Maybe the sleep deprivation thing is an excuse. I mean, either way, I just plain love the stuff. Even though I’m usually down with simple straight-up iced coffee concentrate over ice with some half and half, sometimes I like to mix it up a little. 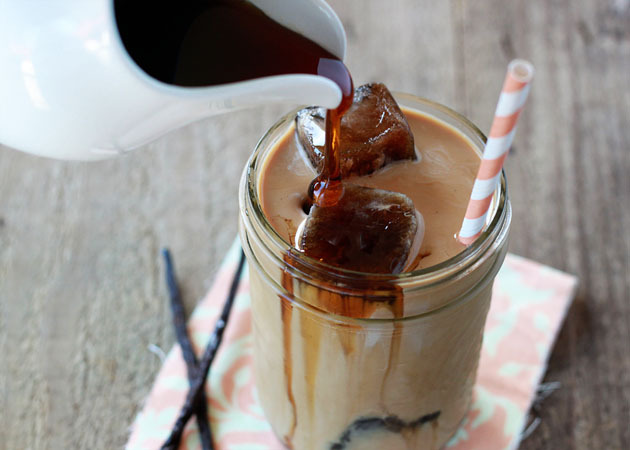 Lately I’ve been dreaming of all sorts of variations on iced coffee (basically I’m obsessed, if I haven’t yet made that clear), and this maple vanilla iced coffee is, so far, one of my faves. As you can see in the photo, I enjoyed this particular cupful with coffee ice cubes in lieu of regular, so I was a little jittery after all that caffeine. But awake, definitely awake. And happy. 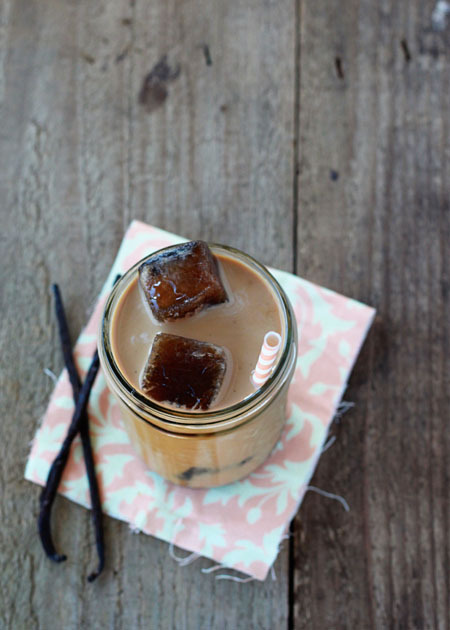 Iced coffee – especially maple vanilla iced coffee – is just a happy-making thing. In a small saucepan over medium-low heat, add maple syrup along with the vanilla bean and the seeds scraped from the vanilla bean. Bring to a low boil and simmer for 10 minutes. Remove from heat and let sit for 30 minutes. Discard vanilla bean and stir in vanilla extract. Store in the refrigerator in an airtight container. Keeps for about 2 weeks. Fill a large glass with ice. Pour iced coffee concentrate over the top. Drizzle in maple syrup and add a splash of half-and-half if desired. Stir and serve with a straw. Have you ever tried Grade B maple syrup? It’s my newest obsession. It makes regular maple syrup taste like water. It is AMAAAZING. Although I’m not much of a coffee drinker, infusing vanilla into maple syrup is definitely something I can get behind. Delicious! Umm, this sound delicious!!! Great idea! Thanks for sharing!!! Thanks so much, and thanks for visiting! When my husband and I moved from the east coast to Oregon I sat in the passenger seat with a gallon of pure maple syrup from Vermont in my lap. We didn’t have room for it anywhere and there was NO way I was leaving it behind! This sounds delicious and refreshing. This looks so refreshing! I want one now! But I’m out of maple syrup. Pinning for later. 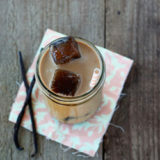 Maples syrup would go so well with iced coffee! This will especially be a great treat in the summer, when the temperatures are up! Totally going to be making this this summer! Yummy. This is joshs favorite drink! And really, Maple Vanilla makes everything better. 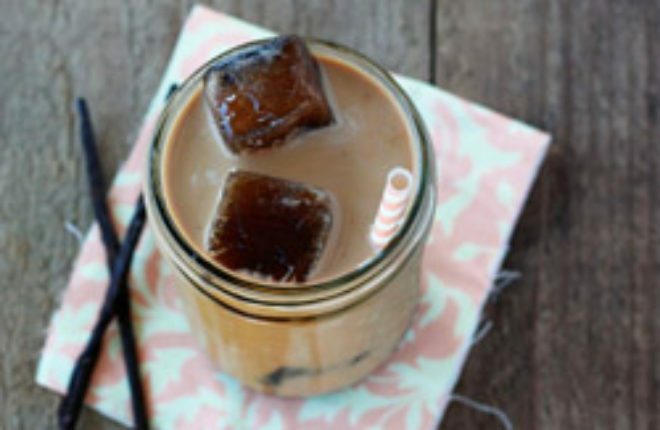 I had featured U in the post of Beat The Summer Heat With These 7 Homemade Iced Coffee on AllFreshRecipes, if u have any other Eats want to be featured. let me know. Hi Sarah! Thanks so much for featuring me – I am honored! Couple of Q’s – my syrup thickened quite a bit once it cooled. It was thicker than before I began…did you experience this as well?